Kong Dog Toys are fantastic! Just like humans, dogs also need some tender loving care and providing your dog with great toys to play with is just one way to show them how much you love them. So, giving your beloved pet dog something that is worth their playtime and healthy mental development would indeed be a great idea. Dog toys, especially Kong type dog toys are particularly good for honing the different aspects of your dogs health and development. More than that, the kong family of dog toys will give your dog hours of enjoyment. There are a huge number of dog toys in the market, but if you are into quality and durability, kong type dog toys are one of the best choices around. However, one thing you should consider is the type of dog toys that will best suit your puppy. Kongs come in many diverse styles such as the famous classic kong toy, the chewable Wubba toys, the Kong Football toys, kong stuffed animals, and even the tasty Stuff'N Kong toy treats. You can be assured that each of these kong toys are designed and crafted with perfection in mind so buying them for your puppies or dogs will definitely be a great investment and they last so much longer than most dog toys on the market so its a win-win. discuss each so you can decide what type of dog toy you should buy for your German Shepherd. First, let's talk about the traditional, Classic Kongs. These come in many sizes too so as your dog either grows you can let your choices of Kong toys grow too. The next kind to discuss are the kong stuffed animals. These are great if you have just bought a puppy. Stuffed animals can help keep your new baby company. Stuffed animals help the puppy to easily adjust to being away from its mother. Not just that, it can also encourage your dog to easily get used to its new environment. Another good choice of kong dog toy are the tennis ball ones. Dogs can get unruly and they are often very active too so one of the best things to do is to match its aggressive and playful side to the appropriate type kong toy balls. Not only can your dog chew it, but these balls can roll and bounce, allowing your dog to run up on it, jump on it, throw it about, bat it with their paws and chew it silly. And lastly, kong dog wubba toys don't tear up easily and they can give your GSD total fun playtime. More than that, these kong dog toys also help to keep your pup’s teeth clean. The wubbas long tail makes it much easier for you to grip and throw too - plus dogs love to shake these tails. Before you buy any kong toys, you need to consider some important pointers like the breed of your dog, its weight and size, etc. Choose the right kong toys according to your pups breed and size. Read the package to know the right toy suitable for your own individual breed of dog. When in doubt, it's better to buy a toy too large than too small for your dogs mouth. 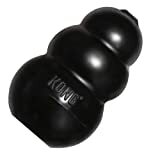 So, if your dog toys need to be strong, you've got one place to go - get your dog a Classic Kong. Kong toys are great! Let your dog show you just how much they love them - day after day.